Help us create an adventure community around you! to be a part of the Beta right here in Arizona. Pakpak is a platform for everyone to connect around the great outdoors. The adventure feed is where you can browse all of the activities that others in your area have posted. You can see what kind of activity they would like to do, where, when and whether they want to adventure on-on-one or with a group. You can filter the feed to only see specific types of activities, dates and location. Starting your own adventure is easy. Just fill out what you want to do, when, and where. Publish it to the feed, share it on your profile and social media and boom, your ready to make new connections and explore the amazing world we live in. We are Launching in Arizona! Arizona is chock full of fun places to adventure! From mountain biking in the Sedona red rocks, skiing at Snow Bowl, to hiking some of the most beautiful and extreme landscapes found in the United States. What better place start creating the first outdoor adventure community than the sunshine state? Thats ok! 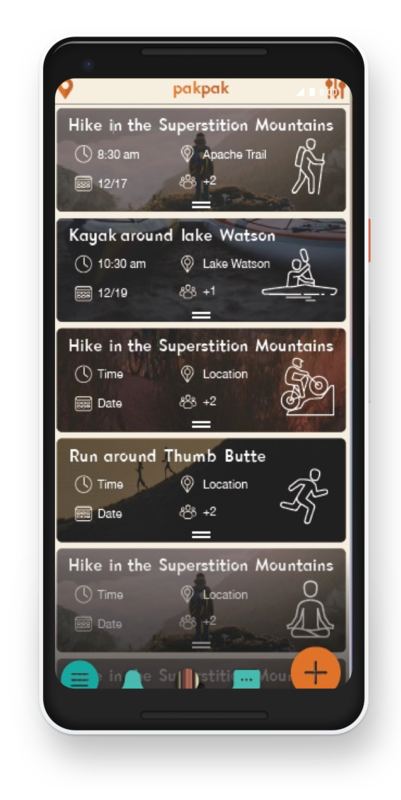 After we make sure everything is working well with the app in Arizona, we plan on expanding the adventure community throughout the United States. Sign up for our mailing list and let us know where you live so we can make sure you are the first to know when we come your way!